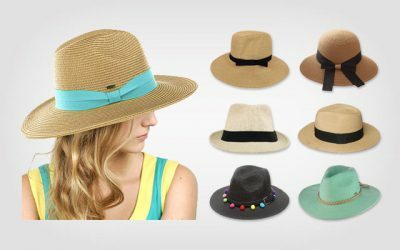 If you ask me about the type of summer hats for women to wear in the summer, there are quite a few such as fedora hat or baseball cap (Here are other examples of the best types of summer hat). However, when it comes to the winter hat, the most popular type is undoubtedly the beanie hat. It is a must have hat for your winter wardrobe. You can easily put this hat on or pair it with other pieces of your clothing. It is capable of keeping your head warm in the cold days and covering your messy hair. There are a few features you need to consider when choosing a suitable beanie hat such as materials, designs, and colors (Follow this link for more details on choosing the most suitable beanie hat). 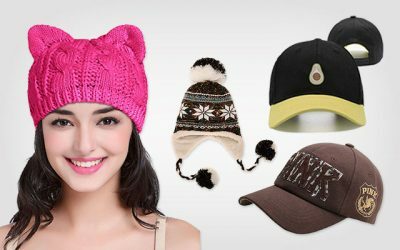 Why don’t you check out this review for the list of 11 best beanie hats for women this season to see if there is any hat which is ideal for you. One of the most reputational brands which produce the highest quality Beanie Hats For Women is C.C. Hence, undoubtedly, the first beanie hat I want to recommend you is the one from the company. This beanie hat is made of 100 % of acrylic which is stretchy and comfortable. The material of this beanie hat is thick enough to keep your whole head warm. You will not feel irritated at all even though you have to wear this beanie hat for a long time. Also, with its special design of a top hole on the top, you can easily pull your messy bun or high ponytail through on chilly days. You can also choose to wear this hat in many ways- for instance, with a low or high opening. Looking for other tips to wear a beanie hat, check out this article https://thebesthat.com/7-fashion-tips-on-how-to-wear-a-beanie/. 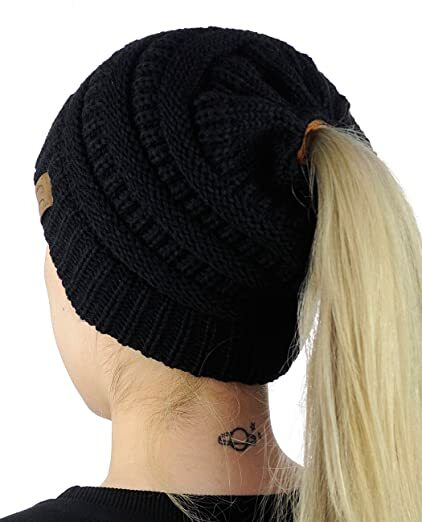 Another detail you can notice from this beanie hat is that it has a stretchable rubber band which you can use to tighten the ponytail after you wear it to make sure it stays fit and secure on your head. Also, you can loosen it, making it easy to take the hat off without messing your hair. This beanie is available in a wide range of colors- from the dark colors like black and grey to lighter colors like pink and yellow. 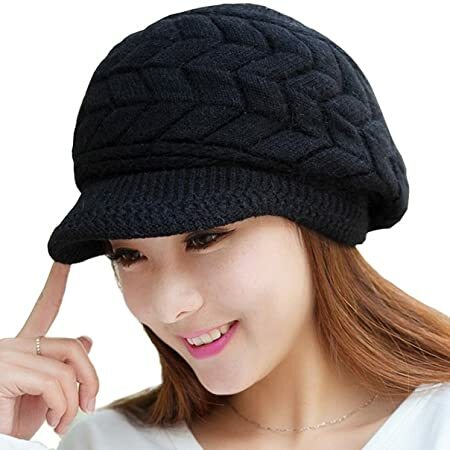 If you are looking for solid beanie hats for women with ponytail, this one is worth considering. Provided that you prefer a beanie hat which is more colorful than other plain and solid beanie hats on the market, check out these beanie hats. 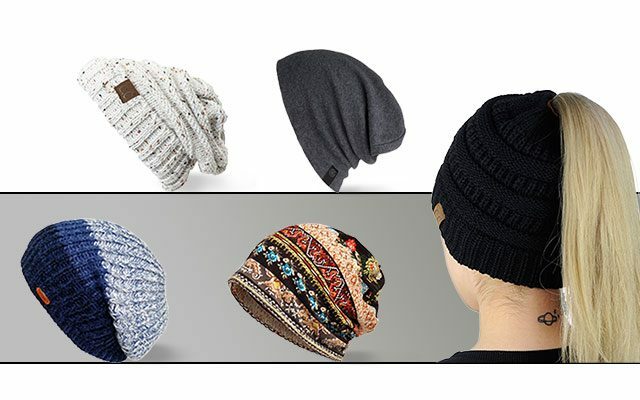 The manufacturer sells these beanie hats in a pack of 2 beanie hats with the same design but different patterns. It features a slouchy design which would go well with your casual daily outfit. These beanies for women are quite thin. Hence, they are suitable to wear in the autumn or early winter days. They can bring the coziness and warmth to your head on these days without making you feel too hot. These beanie hats are made of 100 % of polyester. This material is soft and lightweight on the tough. In addition, the material also makes the hat breathable, durable and weather resistant. And these beanie hats also have a quick drying performance as well. The inner fleece of the beanie is of high quality to make the inner part of the hat very comfortable and well ventilated. In addition, it could absorb sweat well to keep your head cool all of the time. Keep in mind that you should wash these beanie hats by hand only. 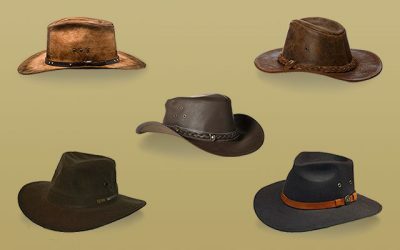 Washing them with the washing machine or with hot water will damage the quality of the hat badly. You also shouldn’t stretch these beanie hats too much or they will be deformed quickly. 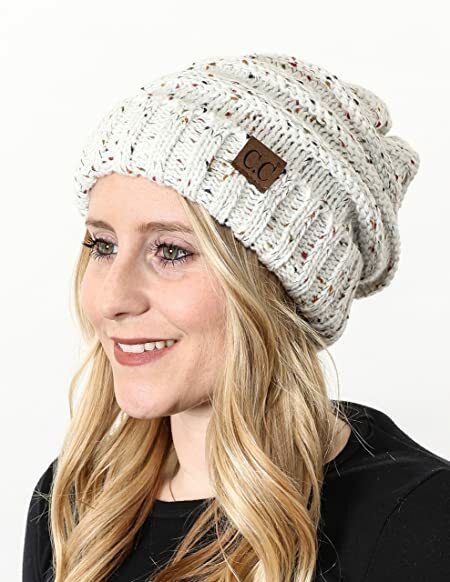 If you are looking for womens winter beanies, you should check out a thick beanie hat like this cable knit beanie from Tough Headwear. This hat is made of 100 % of acrylic. There are several options of colors for you to choose. 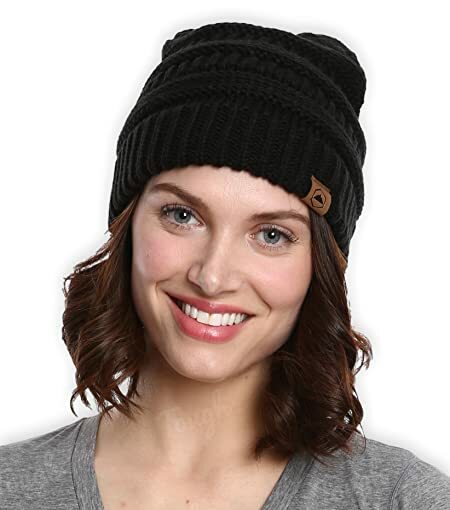 You can either go for dark colors such as the black beanies hat for women. Alternatively, you can buy the white or the pink option. This beanie hat is chunky and warm enough to wear in a cold winter day. The material is made from the premium acrylic yarn which is not only thick and warm but it is also very stretchy and comfortable. And while it is available in 1 size, this beanie hat can stretch to fit all types of noggins and types of hair. Not to mention that the material is tough and durable. Another thing that I love about this beanie hat is that it is carefully made to make sure that the construction of the hat is very sturdy while there is no loose thread on the hat. This hat doesn’t take time to break in. It feels comfortable and provides a snug fit for your head right after you buy it. Are you looking for a classic womens knit beanie with a hint of confetti flecks? Check out the best option here. There are more than 20 options of colors for you to choose from- from the best seller oatmeal, to green, pink, and red. 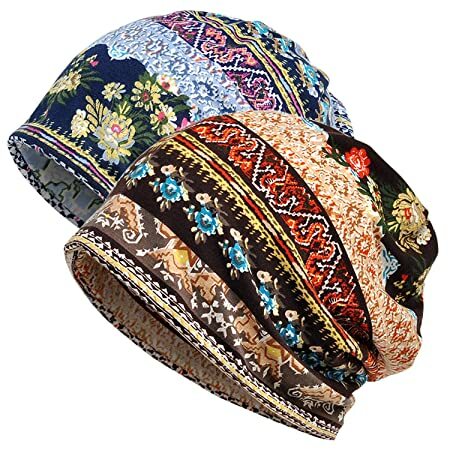 If you want a traditional looking beanie hat (Without any pom pom or such) and in colorful yet traditional patterns, this one is worth your purchase. This knit beanie hat is available in 1 size. Still, the material of this hat offer plenty of stretch and a snug fit for your head. It would not leave any red mark on your forehead after you have been wearing it for a long time. It is made of 100 % of premium acrylic which is also very tough and durable. You can wash this beanie hat both by with the washing machine or by hand. Even if I washed this hat for several times, the color of the hat remains solid and the construction of the hat remains firm and sturdy. 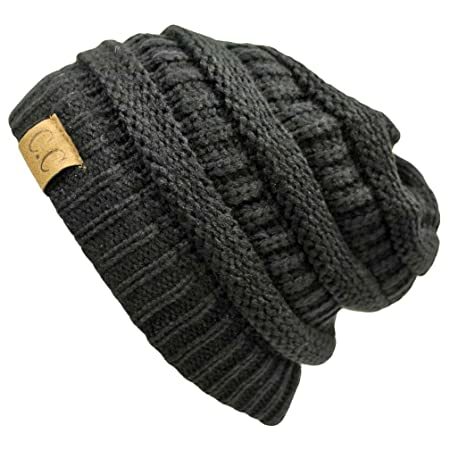 The material of this beanie hat is super thick, not to mention that it is double knitted. This beanie is very warm and could be able to protect your head and your ears from the cold and wind effectively. Hence, you can wear it during the colder months, especially when you have to spend a huge amount of time outside. You can also wear it when you take part in winter activities such as ice skating and skiing. 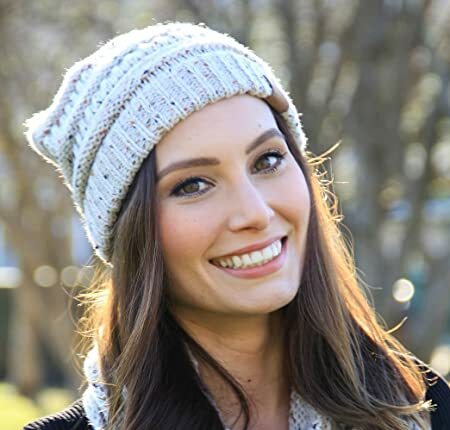 One of the most popular designs of women beanies is the slouchy style. I like this style because it is suitable for a laid back day or any day when I just want to wear anything if I have to go outside. Not to mention that it is super cozy and comfortable. If you also love this style, check out this womens slouchy beanie. It features an oversized crocheted cable knit style with a very fashionable and stylish ridged design. This beanie hat is made of 100 % of soft acrylic which is smooth and very lightweight. It is undoubtedly one of the most stretchy beanie hats that you can find on the market. It would fit your head nicely and you will feel really comfortable even though you have to wear this hat for a long time. Last but not least, this hat is quite big in comparison with other beanie hats that you can find on the market. So if you have a head which is bigger than average, this hat might have a good fit for you. Here comes another slouchy beanie hat from C.C. This hat is available in a wide range of solid colors for you to choose from such as black, white, red, pink, and neon. It is made of 100 % of acrylic featuring the thick slouchy cable knit style. With its solid color and traditional design, this hat is undoubtedly one of the most versatile and functional beanie hats on your wardrobe. You can easily pair it with other pieces of your outfit easily. It is a to go hat for me when I simply need a beanie hat to cover my bad hair. This hat is made from the high quality material, which is soft and smooth on the touch. In addition, it is as stretchy and comfortable as other premium beanie hats on the market. Not to mention that this beanie hat is breathable and lightweight. You can wear this hat in the cold winter days and the hat would be able to keep you warm. You can also wear it when it is not really cold outside. The well ventilated material of this beanie hat will make sure your head feel cool and dry all of the time. Last but not least, this beanie hat is quite stretchy but the construction of this hat is very sturdy and solid. I have been wearing this beanie hat for a long time and wash it with the washing machine for a few times but it remains the same shape regardless. Also, it is well made with all of the carefully and nicely stitched lines. Like most of the high quality beanies for girls on the market, this beanie hat is made of 100 % of high quality acrylic material. This material is soft and comfortable for you to wear the beanie hat for a long time without feeling uncomfortable. It is fleece lined to bring extra warmth to your head in the coldest days. While the material of this hat can be quite thick, it is very elastic and stretchy to fit your head perfectly. If you want a beanie hat with a slouchy and cozy fit, this hat is the best for you. And more importantly, when you compare this beanie hat with other thick beanie hats on the market, you will see that it is very lightweight. In fact this beanie hat has the weight of only 0.22 ounces. While other beanie hats on the market offer mostly solid color design, this beanie hat offers an omber color design. This beanie hat is available in 4 combinations of colors including shades of grey, blue, navy, and black. So if you are looking for a much more colorful beanie hats, you can consider other options in this list. Still, the ombre design is quite unique itself. The thing that I don’t like much about this hat is that it needs attentive care in order to remain in a good condition. You shouldn’t wash it with the washing machine or use a brush to wash it. In order to preserve the material of this hat, you should wash it by hand with cold water only. Undoubtedly, this beanie is one of the cute beanies that you can find on the market. This knit beanie is made of 100 % of soft acrylic. 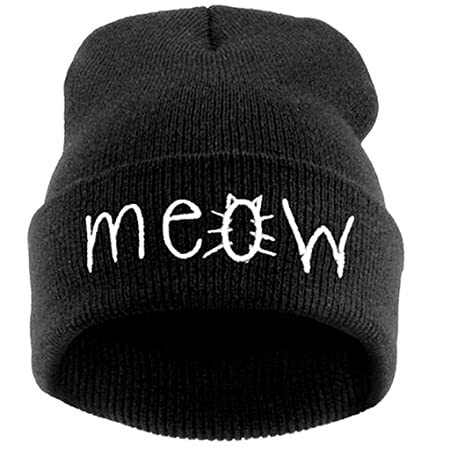 The most distinctive feature of this beanie hat is that it has a MEOW text which is imprinted on the front of folded cuff. If you want a cute image with this beanie hat, you can fold the cuff up to show the image. Or if you just want a casual beanie hat, you can simply fold the cuff down to hide the image. There are 4 options of colors for you to choose from with this hat including blue, black, and wine red. Like other high quality beanie hats that you can find on the market, this beanie hat is made with an excellent craftsmanship. It is double knitted to make sure that the hat is able to keep your head warm even in the coldest time of the year. There is no loose thread and the construction of this hat is very firm and solid. In addition, the material of this beanie hat is very soft and lightweight. Along with the fleeced line, this beanie hat can fit comfortable on your head, causing no irritation at all even though you have to wear this beanie hat for a long time. In general, if you are a cat lover or want to add a hint of cuteness to your look, you can consider this beanie hat. You can wear it in cool fall and winter days. 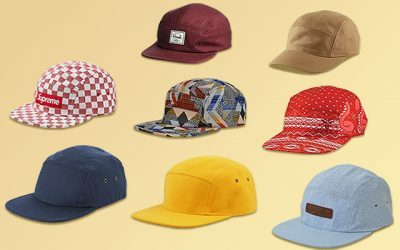 Most of the beanie caps for womens that I recommend on this list are made of acrylic. 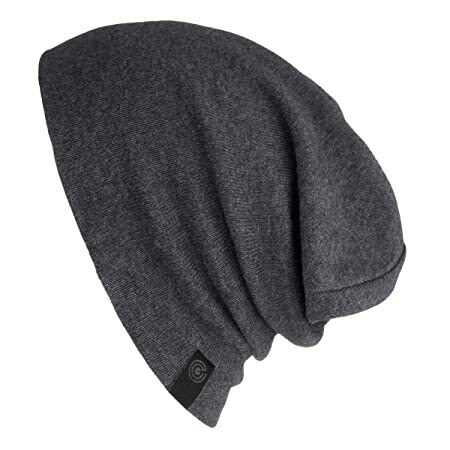 In fact, it is the most common material for a beanie hat thanks to its thickness and warmth. However, if you intend to buy a beanie hat for the early autumn days, you can consider this beanie hat which is made from 100 % of cotton. This beanie hat is thinner and more lightweight than other beanie hats which are made from acrylic. While this beanie hat is available in 1 size, it can stretch easily to fit your head. And this hat is not easily deformed. No matter how much you stretch the hat, it will spring back to its original form. In addition, you can wash it with the washing machine and hang the hat dry. I have washed this beanie hat for several times and the quality of this hat remains the same. Keep in mind that this hat can be a little bit tight for the first couple of times but after that, it stretches well and fit nicely. And it can be folded easily and neatly to fit a small space in your bag. So if you are looking for a beanie hat to bring along with you when you go travel, this beanie hat is a good option fo you. This hat is available in a wide range of colors- from the dark colors such as charcoal grey and black, to brighter colors such as coral and orange. With a wide range of colors for you to choose from, you can easily pick up this hat for everyday wear. It goes well with your clothes and a wide range of styles as well. It is a perfect choice of beanie hat to wear in the mild fall or winter day when it is not really cold outside. 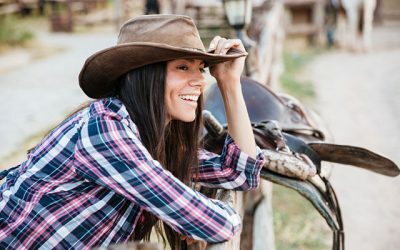 If you have to spend a lot of time outside, particularly under the harsh sun light, you should consider wearing a hat with a cap in order to provide some shade for your face. In case you want to wear a beanie hat, you should choose one among the beanie hats for women with visor. This beanie hat is one of the best options you can have on the market. It is made from 100 % of acrylic fiber. This material is of premium quality which is capable of keeping your head warm for a long time. In addition, it features an inner headband which is made from artificial wool to provide extra warmth to the beanie hat. Not to mention that this hat is made with excellent craftsmanship- there is no loose thread at all. It has a hand-knitted feel which in turn, can have a snug and perfect fit for the contour of your head. The visor on this beanie hat is also attached nicely to the hat to ensure a firm and solid construction. Not to mention that the brim is quite large to provide a lot of shade for your face. You can choose among 3 options of colors including black, beige, and grey. If you are looking for such a beanie hat to wear when you play sports in the board daylight, especially in the cold winter days, this beanie hat is worth buying. Beanie hats for women with pom pom are considered to be trendier than the beanie hats without one. They also help to enhance your style significantly, especially when you decide to wear a simple outfit to go out. If you don’t want to buy traditional beanie hats but a rather more unique option, take a look at this beanie hat with pom pom from Simplicity. 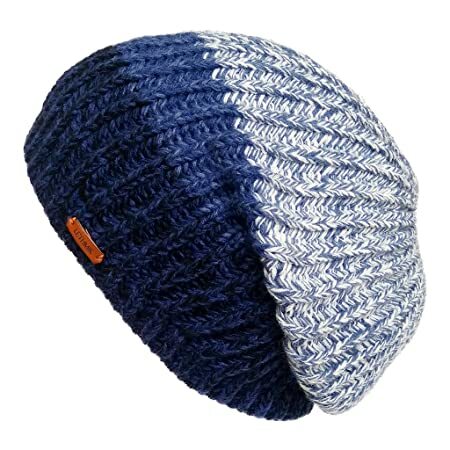 This beanie hat is made of 35 % of acrylic and 65 % of cotton featuring the handcrafted cable knit patterned design. The material is super stretchy and can it most sizes. In addition, this hat has 2 layers of knit, which makes the hat even thicker. Along with the chunky knit construction, this beanie hat is able to main the warmth for your head for a long time. Not to mention that it can cover your ears comfortable with a folded cuff. Use this hat when you take part in an outdoor activity, especially when it is super cold outside. 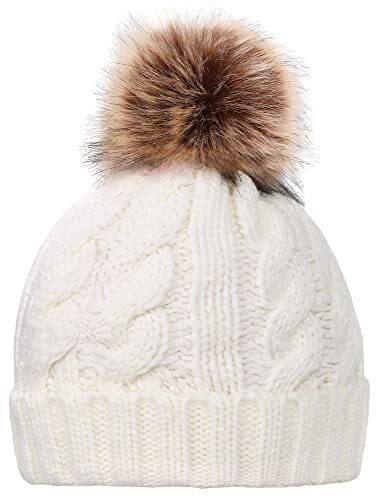 The most significant feature of this beanie hat is that it has a fux fur pom pom decorated on the top of the hat. This pom pom is quite lightweight so you will not feel any burden when wearing this beanie hat for a long time. It is attached nicely and firmly to the hat. And it is would stay fluffy even after you have been wearing this beanie hat for a long time. That is the list of the best beanie hats for women that you can find on the market in 2018. As you can see from the list, there are beanie hats of different styles and materials. Some have visor while some have pom pom to decorate the hat. Think about what you need in a beanie hat. Do you need a casual hat or do you need a unique beanie hat? Also consider when and where you are going to wear the beanie as well. As long as you think about all of the features including the colors and the materials, you would be able to make the most informed choice. I hope that with the list above, you can quickly find the beanie hat that you like. With your careful consideration, I am sure that you would be able to find the beanie which is not suitable for your style but also very functional and can keep your head warm and comfortable in a cold winter day. I surprisingly didn’t wear any beanies this winter. But I do love this style!